• Pre-order your seedlings in our online store by March 6! • Ask about our edible gardening mentors! Are you growing your own organic food garden this season? Extend your growing season! Learn how to sprout your seeds indoors with grow lights in 2-3 weeks while it’s still too cold to germinate seeds outdoors. Following the workshop, will be a Seed Swap, so bring your extra seeds and your gardening stories. We embrace and support our local gardening community. What better way to do that than while sharing a meal? It doesn’t matter if you are already a Deep Roots volunteer or this will be your first time at one of our volunteer events. We welcome volunteers with many skill sets and interests. Above all we want all our volunteers to do meaningful work that they enjoy, as well as to learn new skills and have fun. Please bring a friend, your kids and family members. Homegrown food is now easier than ever. This is the first time we are offering the opportunity to pre-order seedlings for your edible garden — both for spring planting in April and summer planting in June. Good Earth Greenhouse in River Forest is excited about growing seedlings for Deep Roots Project. This is part of our free new “Crop Planning” education series that kicked off at the Crop Planning Workshop presented by Dan Gibbs on January 27. A video of the workshop will be available in early March. Depending on weather we will tell you the best time to pickup and plant your seedlings. Pick up from Good Earth Greenhouse, 7900 Madison, River Forest (708) 366-9500, Depending on interest from our gardening community we may also take seedling orders for your fall harvest. A planting and harvest calendar PDF will also be available for download on our website soon. Seedlings come in a pack of 4 as shown above. Pick from 23 varieties that grow best in our area. 4-pack of seedlings is $4.00 ($1 per seedling). A full tray of eight 4-packs (32 seedlings) is $25 (78¢ per seedling). Since spinach doesn’t transplant we are selling spinach seeds instead of seedlings. The rest of our online store products don’t need to be prepaid like the seedlings. You can pay for your order when you receive your purchase. Our director David Murphy can visit your yard to help decide the best location for a raised bed or a container garden. We will continue monthly free workshops on organic edible gardening and related topics like growing a beautiful toxic-free lawn, food preservation, the best foods for good health and extending the gardening season. Crop planning for spring, summer and fall harvests will be a continuing theme at workshops. Contact David Murphy dmurphy[at]deep-roots-project.org and (773) 502-5600) if you need a garden mentor. A video of our Crop Planning Workshop held on January 27 will be online in March. We hope your year is off to a great start! I always spend the last week of the year cleaning, dusting, and decluttering. This time I came across a seed catalog I’d saved from years ago. It’s from the Kitazawa Seed Company, which specializes in Asian vegetables (the selection of Chinese, Japanese, and Thai eggplants alone is incredible). The company celebrated its 100-year anniversary a couple years ago, and its history is an inspirational story of culture, identity, perseverance, and fortitude. The catalog made me think back to my very first garden. All the seed I used for that garden was from the Kitazawa Seed Company and, as I set out, I kept wondering if I was in way over my head. But, it ended up being a great experience, and I distinctly remember a bounty of delicious Japanese cucumbers and Chinese radishes (among many other things). My reminiscing about that garden from long ago reminded me that every garden has a story behind it: the motivations for investing all that time and energy, the successes and failures, the lessons and insights gained. Each of us comes to gardening for any of a variety of reasons, and that’s what makes for a beautiful and diverse community. What I love about the work of the Deep Roots Project is that it supports people and their gardening endeavors, whatever their backgrounds or experiences might be. Some of us are experienced gardeners (and even farmers, which you’ll see if you keep reading), and some of us are new to it. Some of us have big crop aspirations, and some of us just want to keep a few plants in containers alive. Whatever your story is or your goals are, we hope you’ll stay connected so we can keep growing together! The Deep Roots Project had a busy and productive 2018! Our volunteers put in countless hours over the course of the year to provide education and community outreach to as many people as possible in Oak Park, River Forest, and surrounding communities. 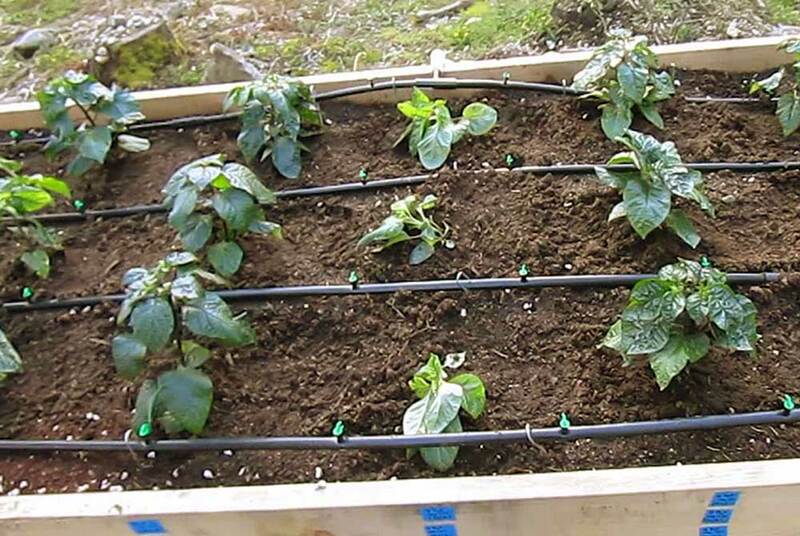 In 2018, Deep Roots held a dozen workshops on topics such as irrigation systems, season extension, and raised bed gardening. Close to 250 participants attended these free, hands-on workshops. Deep Roots received a $17,000 Big Idea Grant from the Oak Park-River Forest Community Foundation to provide free Inspiration Gardens to residents and organizations in the area. These gardens include a raised bed, all necessary supplies and plants, installation, and continued technical support. We awarded 10 Inspiration Gardens to sites throughout Oak Park and River Forest, including the Trailside Museum, West Suburban Temple, Dominican University, and Ascension School. Last year, we installed six of these gardens. In July, we hosted the Inspiration Garden Award Celebration at the Trailside Museum in River Forest. Deep Roots was also awarded a $10,000 grant from the Kott Memorial Charitable Trust to support a new multigenerational gardening project starting this year. Five accessible raised beds will be installed at locations throughout the community that will most benefit seniors. Deep Roots volunteers and youth groups will partner with older gardeners to plant and maintain the beds. In addition, Deep Roots received a Green Award from the Oak Park Environment & Energy Commission. Last year, we launched the Healthy Lawn, Healthy Family Pledge initiative, which asks Oak Park and Forest Park residents to commit to eliminating the use of pesticides and harmful chemicals in their yards. Since Deep Roots started the initiative, 64 properties have signed on. We estimate that 115,200 square feet of lawn space is now entirely free of chemicals and 515 pounds of pesticides have been removed from the community! Deep Roots also supported sustainability efforts in Oak Park and River Forest through Green Block Party events, which include presentations about the benefits of sustainable gardening, the elimination of harmful toxins from yards, and the importance of native plants and pollinators. During 2018, we held eight Green Block Party events in Oak Park. In addition, we hosted another 15 Green Block Party events in River Forest and installed 16 Pollinator Parkway native plant gardens throughout the community. We also held monthly volunteer meetings open to the public, where we had an opportunity to network, learn more about Deep Roots and how to get involved, and share information about sustainable gardening and edible gardens. Deep Roots expanded its outreach by focusing on our website. In 2018, we opened the online Deep Roots Project store in an effort to promote edible gardening and to help make the organization financially sustainable. The store offers handmade cedar raised beds, a custom soil blend, and a variety of other garden inputs. The response to our new store has been amazing, and we’re looking forward to continuing to offer organic, high-quality products. Last year, Deep Roots developed its online resource library, blog, and newsletter in order to reach even more people and grow our volunteer program. We have another great year planned, filled with more projects, workshops, events, and garden installations. We hope you’ll stay in touch and join us! Winter is a great time to plan a garden and figure out ahead of time what you’ll need to hit the ground running when planting time comes around. On January 27, Dan Gibbs will be leading a Crop Planning Workshop to help you put your 2019 plan on paper, add a level of precision to your gardening, and take your garden to the next level. Dan will show us how to increase the yield from our gardens by putting a plan together for a full and long growing season. He’ll discuss a range of topics, including seasonal crops, seedlings, crop rotation, ways to maximize space, pests, and how to schedule amendments for soil and plant health. Once again, Dan brings years of experience and knowledge to share. I had a chance to sit down with Dan recently, and you can read more about his interesting background below. The workshop will be held at the Oak Park Public Library’s Maze Branch from 2:00 PM to 4:00 PM. We hope you'll join us! If you’ve attended a Deep Roots Project workshop or volunteer meeting, you’ve probably met Dan Gibbs. Dan has conducted several workshops on topics including extending the growing season and preventing pests and disease. He’s a wealth of knowledge and expertise about sustainable and organic gardening, and we’re so glad he’s part of Deep Roots. The story of how Dan got into farming shows that sometimes life can take you down unexpected — but nevertheless wonderful — paths. Dan is a River Forest native, but in 2000 he moved to Southeastern Wisconsin, where he purchased an eight-acre farm. For four years, Dan sold produce from his farm to restaurants and grocery stores in Wisconsin and here in River Forest and Elmhurst and also delivered to 100 households. The list of crops is lengthy and impressive (and makes my mouth water): broccoli, carrots, beets, sweet potatoes, tomatoes, eggplant, sweet corn, squash, pumpkins, melons, cauliflower, onions, fennel, lettuce, cabbage, spinach, arugula, Swiss chard, collard greens, kale, radishes, kohlrabi, beans, and peas. What’s even more amazing is that Dan was running this operation on his own! In 2010, Dan sold the farm and moved back to this area, but he continued to be an advocate for sustainable food production and urban gardening. Today, he runs his business, The Backyard Farmer, where he helps his clients plan, design, install, and maintain food gardens. He’s also the president and garden leader of Austin Green Team, an organization that converts derelict properties into beautiful gardens. “I love the idea that anyone has the power to grow what they enjoy eating. I believe it is very important for people, especially children, to have an understanding of how to grow food as well as the importance of good food,” says Dan. Dan’s contribution to Deep Roots and his commitment to making gardening accessible, enjoyable, and rewarding are immense. His enthusiasm for growing food is also infectious, and you’ll be inspired to nurture a garden of your own if you spend any time with him. We hope you can come to Dan’s crop planning workshop later this month! The Deep Roots Project store supports all the other education, outreach, and community work we do. There are beautiful handmade cedar beds available, along with everything you need to start and maintain a thriving garden. We also deliver soil and mulch and install garden beds. Please check out what we have to offer and spread the word! The Deep Roots Project is a 501(c)(3) nonprofit organization. We are a community of volunteers who teach, mentor, and encourage people to successfully grow bountiful edible and native gardens and to remove pesticides and toxins from their yards. We host monthly workshops, operate an online store, and coordinate a healthy lawn pledge. Learn more about us, get involved through our events and initiatives, support our work, and share our message. For any questions about sales or programs, please contact David Murphy at dmurphy[at]deep-roots-project.org or 773-502-5600. Greetings from the Deep Roots Project! My name is Camille Fink, and I’m a new Deep Roots Project volunteer. I'm really glad to be connecting with you, and I'm here to let you know about all the exciting things we have going on. I've gardened off and on over the years. And when I got two plots in a community garden earlier this year, it had been quite a while. It’s been a season of highs and lows. The highs — a bounty of squash and the beautiful Mexican sunflowers that popped up recently. And the lows — cucumber seedlings that bit the dust in the wildly fluctuating spring weather and a mystery bug that kept decimating my tomatoes. I’d forgotten how gardening can be a real emotional rollercoaster. Or perhaps I just get too attached to my seedlings. In any case, I'm glad that I’ve gotten involved with the Deep Roots Project. It’s a great group of like-minded folks — people who don't just love gardening but are also thinking about how that relates to social, environmental, health, and sustainability issues. I also really appreciate their constant enthusiasm to get the word out and get people involved. And this month is no exception. Read on to learn more about our upcoming workshop and how to have a great fall gardening season! I moved to Chicago from Los Angeles several years ago, and people always ask me (mostly jokingly, usually in the dead of winter) why in the world I would do that. The truth is that I’m the only Southern Californian I know who dislikes perpetual sunshine and who finds the weather there boring. I love the different seasons here and the way the pace of life changes throughout the year. I also really like scarves and hats, so bundling up for cold weather makes me happy. Fall is hands down my favorite season, and we’re just a week away from its official start! For me, fall has become largely about winding down and prepping for the impending winter hibernation. I had planned on shuttering my gardening operation for the year, but the next Deep Roots Project workshop is making me realize that I have it all wrong and that fall is actually a great time to keep the garden up and running. I’ll admit, though, that I’m not really sure where to start. If you’re confused like I am about how to go about planning a fall garden, then this workshop is for you! On September 23, Dan Gibbs will be leading a Season Extension Workshop where he’ll tell us all about how to successfully grow well into the fall. He’ll discuss growing cold-hardy crops as well as using cold frames, hoop houses, and row covers. Dan brings a wealth of knowledge and expertise to share with us. He was a commercial organic farmer in Wisconsin and now helps people transform their backyards into what he calls “mini-farms” through his company, The Backyard Farmer. This is a special opportunity to get lots of great information from someone who knows all there is to know about fall gardening. We hope you’ll join us! workshop, we've put together a list of tips for selecting fall vegetables, preparing soil, and watering, along with links to fall vegetable growing guides. I recently went to visit Ana Solares at Empowering Gardens, a small nursery in Forest Park that supports a wonderful goal. Their mission statement says it all: Everyone should have the opportunity for a fulfilling and meaningful work experience. As such, we strive to provide people with varying skills and abilities the assistance they need to have an equal opportunity and the support to be more involved in their community and society. So, not only does the Empowering Gardens nursery have a fantastic selection of plants, it also gives people with a range of disabilities invaluable work experience and job skills. It’s a win-win all around. Ana was kind enough to show me around the nursery, and I asked about the fall seedlings they have available. Well, it’s a long list: mustard greens, collard greens, swiss chard, kale, red romaine lettuce, cabbage, radishes, beets, cilantro, spinach, borage, and sunflowers. The seedlings are organically grown from heirloom seeds, and they all looked happy, healthy, and ready to go into the ground. I couldn't resist bringing home a cilantro plant for all the salsa I plan to make from my tomato harvest. The Empowering Gardens nursery is open now until the beginning of November. (During the winter, they move to an indoor space where they sell houseplants and holiday items and go back to the outdoor space in the spring.) They’re located at 7730 W. Madison Street, and we hope you’ll check them out. Ana and her wonderful staff will be happy to get you set up with all the plants, garden supplies, and gardening tips you’ll need to have an amazing fall garden! The Deep Roots Project store supports all the other education, outreach, and community work we do. There are beautiful handmade cedar beds available, along with everything you need to start and maintain a thriving garden. Please check out what we have to offer! Our next monthly meeting is on September 28, 6:00 pm - 8:00 pm at the Good Earth Greenhouse in River Forest. This is a wonderful opportunity to meet the other Deep Roots Project volunteers, learn about all that's happening, and perhaps pick up something delicious from Estelle Carol's garden. We hope you'll join us! We are working hard to serve our Deep Roots Community. Please enjoy the following stories and know you can support us through our garden supply store for your late season gardening needs like mulch and composted manure. Also, we welcome you to attend one of our upcoming workshops or our monthly meeting at Good Earth Greenhouse on the 4th Friday of each month. Monsanto found GUILTY on all counts! In a historic victory on August 10, Monsanto was ordered to pay $289 million in the first Roundup cancer lawsuit. It’s time to take the Deep Roots toxic-free lawn pledge! “[Monsanto] is a company that has always put profits ahead of public safety,.. and today, Monsanto has finally been held accountable.” The science and politics behind the Roundup controversy is fascinating – including Monsanto/EPA collusion and distortion of scientific research. Read our four favorite news articles about this game-changing court case on our “Healthy Lawn, Healthy Family” pledge page. Gardening and lawn care chemicals can be harmful to humans, pets, wildlife and waterways. The good news is there are many surprisingly easy ways to care for your lawn and garden that avoid putting your family and neighbors at risk, like watering correctly, mowing high, applying compost tea, reseeding often and using natural non-toxic fertilizers. See our Natural Lawn Care page for more information. When the Deep Roots Project cut the ribbon on their first Inspiration Edible Garden Bed awarded to the Trailside Museum of Natural History on Sunday, July 29, the program was more than just about growing food, it was about connecting communities and working together to make a culture shift. With lovely weather and a reason to celebrate, over 50 people gathered in the beautiful Nature and Play area at Trailside Museum to hear about local environmental initiatives, eat delicious fruits and vegetables, sing and celebrate the sustainable idea of growing food in your front yard instead of grass! The Wednesday Journal article entitled Greening the Community, One Edible Garden at a Time: Deep Roots Project aims to change the way people eat published two days before the event. Did you know that fall is the best time to set up an edible garden and fertilize for spring? A thick cover of dense leaf mulch keeps veggies moist in the dry hot days of August. Fall is the best time to install new edible raised beds for a spring garden. Contact David for advice on cost, bed size, soil, mulch, delivery and best location in your yard. The height of summer is not the best time to start tender seedlings of anything. Hot days, sparse rain, and heavy pest pressure must be factored into growing from seed. It’s easier to grow seeds indoors under grow lights in late July or August in a self-watering seed-starting tray with a capillary matte. Buying seedlings for August planting is much easier and more reliable than growing from seed. Deep Roots has ordered fall seedlings of lettuce, spinach, swiss chard, collards, kale and more. Garden fabric (called “row cover”) can protect fall plants from light frosts by raising the temperature about 10 degrees. Fall is the best time to super-charge existing and newly installed edible beds with a powerful and inexpensive organic fertilizer called composted manure. If you don’t already have biochar blended into your existing edible bed soil fall is the best time to add it. Deep Roots store soil blend always includes biochar. To keep out weed seeds cover your dormant veggie beds with black landscape fabric. Deep Roots will provide delivery of bulky garden products like raised beds and soil. Get free consultation when you buy a raised bed, soil, mulch, fertilizer, seedlings or other products and services from Deep Roots. Contact our director David Murphy at (773) 502-5600 and dmurphy@deeproots-project.org. From 2 to 4 p.m. Sunday, Aug. 26, in Estelle's garden, at 323 S. East Ave, in Oak Park. Learn about various ways to water your garden, including when to water, how to water, rain barrels, drip irrigation, automatic irrigation, the importance of dense mulch and more. Buy local and fund our mission. We offer superior quality, great value, easy setup, attractive design, delivery and installation. Win an Inspiration Edible Garden worth $1000! Our purpose is to inspire the community to grow healthy food, remove toxins from their yards and donate a portion of their harvest to the hungry. Share the benefits of creating healthy and beautiful green spaces free of toxic chemicals with a vibrant growing community. Our Deep Roots Monthly Meetings are a way to share skills, make friends, solve problems and find out about volunteer opportunities. It’s also a time to find out about discussion groups like garden design and health and wellness. We want to hear your ideas about how to make Deep Roots work better for everyone. Join us on the fourth Friday of each month for our Deep Roots Monthly Meeting from 6 to 8 p.m. at the Good Earth Greenhouse, 7900 Madison St., in River Forest. If you have questions, contact Briana our volunteer organizer at (708) 878-3639 and bvforestpark@gmail.com. Support our Deep Roots community, find your passion to make a difference and connect with others! Q: Where did the vegetable go to have a few drinks? A: The Salad Bar.